Editor’s note: Daniel Vajdic is a researcher in foreign and defense policy studies at the American Enterprise Institute. The views expressed are his own. At least as far as foreign policy went, Russia received an unexpected amount of attention in this year’s U.S. presidential election campaign. Whether it was the Romney team’s dismissing the so-called reset, its claim that Russia is America’s “number one geopolitical foe,” or President Obama’s infamous open mic moment, in which he promised his Russian counterpart “flexibility” on missile defense if reelected, ties with Moscow kept cropping up. It is, of course, true that the Cold War world no longer exists, and that Russia occupies a far less significant space in American foreign policy. And the U.S.-Russia relationship simply is not as overtly antagonistic as it was in the Soviet era. But it is also clear that Russia continues to pose serious challenges for the United States. With this in mind, here are some suggestions for President Obama for how he should approach Russia in his second term. Forget the reset. The election is over. It’s time to face reality. And the reality is that Russia has rapidly regressed from soft authoritarianism into a less qualified dictatorship that shields brutal regimes around the world with ever greater brazenness. 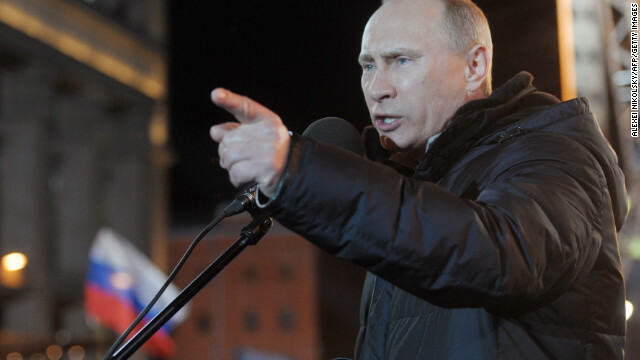 What’s more, the Russian leadership has all but acknowledged that the reset is over. And if you don’t trust the Kremlin’s words, then consider its actions. Putin blamed opposition protests on “signals” that Hillary Clinton had supposedly sent to incite revolts against his regime. In September, the Foreign Ministry announced the expulsion of USAID from Russia and rejected the State Department’s request for a six-month extension to wind down grants. And, last month, Moscow decided that it will not negotiate a follow-on Nunn-Lugar cooperative threat reduction pact with the U.S. These are trends that even the reset’s most ardent supporters cannot ignore. Discuss human rights. Any U.S. administration will make democracy and human rights promotion a component of its foreign policy – it is part of who we are as a nation. But some presidents place more emphasis on this than others, and President Obama has been oddly reluctant to talk about Russia’s weakened democracy and the country’s deteriorating human rights record. When the U.S. waxes and wanes in its commitment to human rights from one administration to another, it creates the impression that these are issues are negotiable, when in fact they are not. For Russia specifically, Obama should back the Sergei Magnitsky Act, which was passed in the House on Friday and which would impose U.S. travel and financial restrictions on human rights violators in Russia (and perhaps around the world). The Magnitsky Act has been quietly opposed by the Obama administration on Capitol Hill, while in Moscow the entire spectrum of Russia’s leftist, liberal, and nationalist opposition calls for its adoption. Recognize that they need us more than we need them. With the election over, President Obama does not need to stick to his false narrative that the reset has been a success, and he no longer needs to maintain the illusion of an effective reset policy to blunt Governor Romney’s attacks. This provides an opportunity for the administration to objectively evaluate Russia’s accelerated drift toward authoritarianism and Putin’s unmistakable intent to reduce his country’s interaction with the West. True, Moscow did sign the New START arms control pact. But Russia, unlike the U.S., was already below the treaty’s most important ceilings when it came into force. This was an unconditional yet totally unappreciated gift to the Kremlin. From Afghanistan to arms control – and pretty much everything in between – when Russia works with the U.S., it does so because such cooperation is essential to achieve its own interests. President Obama needs to acknowledge all this as he begins to chart his second term foreign policy. More broadly, he should recognize that he was reelected in spite, not because, of his polices. He will need to change course in numerous foreign policy areas, but Russia is one of the more pressing. "Authoritarianism", "dictatorship"... How is scant imagination of western media, you have ten years of talking about it, it may be time to go to the next level? For example to declare that "Putin's regime" is a Nazi, and Putin is a messenger of Satan. Or the fact that Putin defends bloody regime of penguins in Antarctica. If seriously, how United States can teach democracy to Russia, If US itself is less free and more authoritarian country? Аrguments? Patriot Act which was passed in 2001 which is anti-democratic in its purest form. Cruel suppression of demonstrations "Occupy Wall Street". A huge number of violations in presidential election. Refusal to close Guantanamo and hundreds of other death camps in US. Violation of the sovereignty of countries such as Libya, Iraq, Yugoslavia, Serbia, Palestine and so on. So very funny looks, as one dictatorial country accuses another country in violation of human rights and undemocratic. In fact, today even North Korea can teach U.S. democracy. Daniel talks like the Russian government needs something from the US. They don't. However, the US needs big things from the Russian government. For instance, US supplies and reinforcements to The Troops in Afghanistan transit Russian railroads and airspace. US equipment in Afghanistan mongrel need to be withdrawn using those very same Russian railroads. So do you really think that berating and insulting the Russian government will make them more willing to cooperate on these things the US government wants from them? If so, you're an idiot. The author is right, you all. I'm from Russia and unless one is cynically blind, they should see how ex-KGB Putin's only priority is to stay in power and the wealth the power gives. There should be a point at which any self-respecting nation should avoid dealings with such repressive governments. This is no place for false comparisons and false attacks, commenter 1. US is without question more democratic and free. I have talked to Occupy Wall street myself this august – they don't seem to be cruelly supressed much, while russian opposition is being beaten up, fined, thrown in jails, and killed. It is dangerous business being an opposition journalist in russia (look up Krylov, Kashin, Magnitsky etc), while even the vilest right/left-wing media in US enjoy their freedoms of speech. As for violations in the recent elections, commenter 1 simply made that up - cite your credible sources please. Compare the elections in Russia (was there any questions about the result once Putin announced his bid??) to the US elections to see my point. Commenter 2, US has other supply lines to the middle east without any need for Russia. Saying Russia has no need for the rest of the world, or one of the worlds top developed country, is behaving like an insulted kid saying "I don't need any of you anyway". There is a line at which cooperation matters less than self-respect lost out of friendship with the worlds' atrocious governments. Finally someone in the comments section who is sane. He is lying, i can tell he is not Russian, as he just repeats all the western lies about human rights violations in Russia. I have personally been at several anti-government protest, here in the Siberian city of Novosibirsk. I have never seen anybody being beaten up or arrested. Ever.
" In the USSR, the police at the demonstrations were without weapons and batons"
The US is hardly "the rest of the world". Russia is geographically and culturally connected to Europe and Asia and therein lie her interests. There is not one thing, economically, politically or otherwise that Russia needs from the US. The problem with the current Russian opposition and the reason why they are so unpopular among common Russians is that they somehow equate the US with "the rest of the world" and propose for Russia to adjust to whatever the US wants from her while breaking with her key allies like Iran and ignoring the fact that the economic powerhouse of the 21st century is Asia, not the West. Magnitsky was a lawyer actually have fairly simple – although a very large scale – the speculator to manipulate a variety of holes in domestic legislation, and went to prison, in general, due to these holes, and not because it revealed some crooks in the police (then the police). Magnitsky's arrest was, generally speaking, it is lawful. And now trying to make it look as if it were arrested in the case and closed for a way to hide some proper police dirty tricks. Accordingly, the death of Magnitsky in custody – did not attempt to remove an unwanted witness. The distortion of the true picture allows Magnitsky list, ultimately, as a means to block our activities in the protection of their interests: in fact, to announce who will prevent even some petty swindler beacon of honesty, and his death – a crime of another Russian official, awkward American guards? The only sensible policy here is to be as cordial as possible toward the Russians. They speak a language that is far more beautiful than our own plus the fact that it was they who lead us into the space age without the help of any post WW2 German physicist or engineer! Besides, we are complete idiots for building that so-called "defense shield" in Eastern Europe. Let's just get over our supriority complex! Thank you General Sherman for your post much unlike all these anti-Russian, Tea Partying idiots here who can't even find their rears with both hands! These Tea Party ignoramuses here really burn me up, they really do! Why not send all the freeloading russians back to Putin and let him take care of them .the country would be much better off and there will less fraud commit against the hard working American tax payers. how about that? Gee julia, I bet that you're enough of a Tea Partier to want to send all the black people back to Africa next. I bet that you even hate me for being Irish American, don't you? How about USA stops sponsoring the so-called "Russian opposition"??? What both America and Russia should do is that the presidents shall get together and get a Chinese take away and watch "The Canadian Bacon". Africans are hard working people-not freeloaders nor foodstamps kings and queens. you get my drift? Xenophobia is a thing. It is 2012, not 1954. Хоть раз покажите Россию с хорошей стороны!!! Уже надоело что нас все время показывают как злодеев и мерзавцев.